NASHVILLE, TN – It’s no secret that Internet usage has increased dramatically in the past decade. In 2004, 30 percent of Internet users conducted search engine queries on a normal day. In the present, that number has shot to 59 percent, according to the Pew Internet & American Life Project. 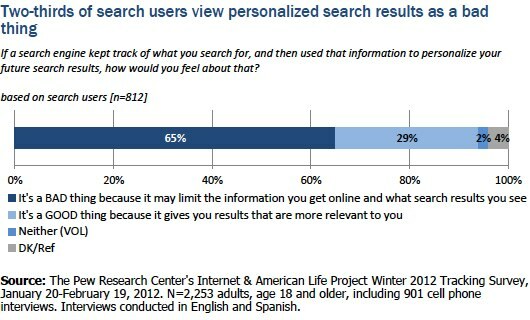 When Google released Search Plus Your World, we reported that Web searches would start getting personal. A study released on March 9 by the Pew Internet & American Life Project shows the results of a very interesting test. Pew wanted to know how Internet users feel about search engines gathering and saving their past histories to use as a guide for future search results. The survey asked approximately 2,000 participants questions about their Internet use, their feelings on targeting advertising, and their knowledge on how to keep their information private. The survey was conducted from Jan. 20 to Feb. 19. Overall, participants did not want search engines to gather that information. A whopping 73 percent of people said they would “NOT BE OKAY with a search engine keeping track of your searches and using that information to personalize your future search results because you feel it is an invasion of privacy.” The Internet users that accept search engines tracking their searches feel that the material gathered allows search engines to customize their results, better guessing what they’re searching for. A chart from Pew’s research shows a breakdown of how Internet users feel (either “good” or “bad”) about personalized searches based on users’ age and income level. The study found that the older one is and the more income he receives, the more he disagrees with this method of gaining tailored results. Personalized searches are certainly controversial, but sometimes they aren’t all bad. If you search for “Indian food takeout,” your past search results could mean that you don’t have to enter your location in each search. If you’re searching for “oil change,” it might annoy some people to get results in other states or regions. It can get cutthroat in the SEO world, but try to keep your client in mind. If your client values privacy, and most people do value privacy, refrain from deceptive practices. Don’t share their email addresses. Don’t clog up their inboxes with irrelevant content. There may be a backlash from Internet users due to the way search engines and websites like Facebook treat their personal data. Keep your customers and readers happy by treating them with the respect they desire. The best way to get readers to trust you is to give them valuable content on a regular schedule. Millionairium’s CEO Ali Husayni believes that focusing on the customer’s needs is the way to achieve success. “Ultimately, humans are more important than the search engine because they are the ones who buy, the ones who will share the content, and the ones who will get you the backlinks to the content, so always strive for a natural tone and relevant topics,” Husayni says. Contact the Millionairium search engine optimizing team to see how we push to get you results while staying true to your customers. You\’re right, Paul. The people are most important. 🙂 Thanks for reading. Hey. People are important because they are the ones who buy. So it is a trusted feeling when they buy. Great Analysis, but little bit complex to understand. However it\’ll provide help to improve SEO. Thanks for sharing.